1. Apply a pastel gel-polish color (Akzéntz Luxio in Lovely). 2. 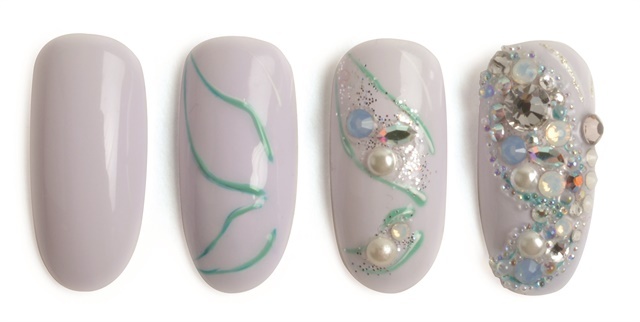 Use gel paint to outline the butterfly wings (Akzéntz Options Green Splash Pastel) and draw two lines near the large wing for the antennae (Akzéntz Gel Play White and Silver Sand). 3. Press loose glitter inside the wings (Young Nails Sea Spray). Apply a thick layer of Akzéntz Gel Play Bling-On over the glitter and start applying a variety of Swarovski Crystals into the gel. Keren Clark, The Villages, Fla.